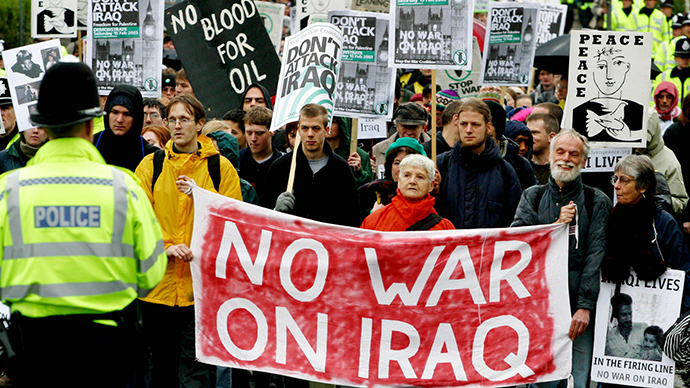 A new documentary by a British filmmaker recounting the day millions of people marched against the 2003 Iraq War has been praised by critics for depicting the widespread opposition to the US-led invasion. The feature-length film, “We are Many,” tells the story of the biggest protest in history and its enduring legacy. Iranian-born British director Amir Amirani’s narrative focuses on February 15, 2003, when over 15 million people around the world marched through more than 800 cities in up to 60 countries. Speaking to RT on Friday, Amirani said he made the film because he attended the demonstrations and subsequently thought they would make a fascinating story. The documentary has been praised by film critics for its broad scope and impressive list of interviewees, including former United Nations weapons inspector Hans Blix and ex-Labour minister David Blunkett. “We are Many” takes its title from “The Masque of Anarchy,” a rousing poem by Percy Bysshe Shelley who became known for his radical politics before his untimely death at the age of 29 in 1822. “Rise like lions after slumber, In unvanquishable number! Shake your chains to earth like dew, Which in sleep had fallen on you: Ye are many – they are few!” Shelley wrote. Amirani uses a combination of archive clips from demonstrations and contemporary talking head interviews. Footage from the protests depicts celebrities such as Danny Glover and Susan Sarandon addressing anti-war marchers. It also includes impressive aerial shots, which show the enormous scale of the protests. In charting the legacy of the marches, Amirani explores how the Arab Spring was influenced by the mass demonstrations. “I made the documentary because I went to the demonstration. It was my first political act,” Amirani told RT. Asked how he funded the film, he said: “[It was] initially funded through Kickstarter and then [comedian] Omid Djalili came in with some funding as executive producer, and then other people came in with private funding as well. “Because we got no institutional funding at all, nothing from the BFI, nothing from the BBC, nothing from Channel 4,” he added. While the film received widespread praise across the media spectrum, one notable dissenting voice was Jasper Rees, writing in Britain’s right-wing Spectator magazine on Friday. “Big-screen documentaries never change the world,” Rees said. “People normally make films [not] because they’re … trying to change things. If you have a good story you want to tell a good story… If it changes the world, that’s great,” he said. Other critics have acclaimed the film for telling an important story. Guardian film critic Peter Bradshaw said the film does a “necessary job” of reminding contemporary Britain about the “gigantic scandal” going to war in Iraq was. Some critics have reserved special praise for the contemporary interviews, which feature a wide range of impassioned activists and politicians, as well as controversial entrepreneur Richard Branson. Prominent figures from the US included Lawrence Wilkerson, the former chief of staff to Colin Powell, civil rights champion Jesse Jackson, and esteemed linguist Noam Chomsky. Former Labour ministers David Blunkett and Lord Falconer also appear in the documentary, although Tony Blair reportedly refused to be interviewed.